I had both the energy and motivation to get on the water this morning after talking to a few people last night. Bill Shearer with his always great reel and rod discussions; Big Ed lamenting about his constant diaper changing and lack of fishing; and the Commander lamenting on my lack of blog posts lately. Well I did get on the water this morning for about three and a half hours. It felt like it has been six months since I last waded into the emerald green. I used strictly jigs today and ended up with 20 bass and 1 steelhead on the Catt. I was dressed for spring weather as it was cold this morning but by 11:330 AM it was 64 degrees and I got out of there. 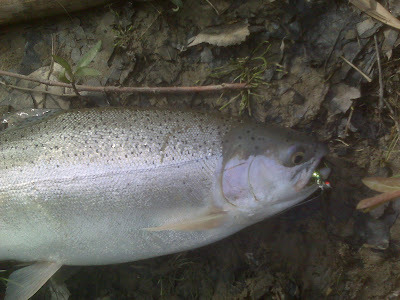 The steelhead was a great surprise and made me happy that there were a few still around. I will put a picture up later if I get time. she was about 3lbs. Ahhh he's back, nice looking specimen Joe. Glad to see you are feeling better...nice fish too.